I'm a planner. I like to know what's going to happen, I like to be in control of what's going on, and I like to have an exit strategy if I end up not wanting to be there anymore. I had the BEST TIME. Because I have one of my biggest events for work on Monday (today for the purposes of this post), I've barely been home and I haven't slept well from stress. Yes, I have done everything I could do and now we'll just have to see how it goes but, nevertheless, I worry. I figured I would need a relaxing weekend. I'd planned to spend a few hours with my friend Julie who is visiting CO with her family, have a quiet Saturday night doing meal prep and laundry, then going to church and the driving range on Sunday. I got up early Saturday morning, drove to the airport to pick up Julie and we had a great morning. We went to brunch at Maddie's, I showed her around where I work, we walked around Wash Park and even went through an open house in a cute neighborhood (I SO WANT THAT HOUSE! Only $1.3 million! ;) ). When I went to drop her off to get her rental car, there was quite a snafu and they had nothing for her. Actually, none of the rental places we called had any cars available. I told her not to worry and that I'd drive her to pick up her friend from the airport and take them both to Boulder where Julie's family would come down from the mountains where they were staying and pick them both up. Sure, it was a dent in my "plan," but I wasn't going to leave them stranded and I really didn't mind - I love Julie! Well, once we were leaving the airport, Julie asked if I just wanted to come up to the lodge with them, hang out and stay the night. My anxiety immediately said to me: "No! That will completely mess up your plan! You probably won't sleep well. You'll be tired tomorrow, you'll get back home too late for church, blah, blah, blah." You know what I did? I told that voice to shove it. After much practice, I've learned to tell that voice that it's wrong. That spending time with people I love (and I LOVE her family) will be much more fun, refreshing and memorable than a night at home with Netflix. So I said yes. With literally the clothes on my back, I headed up for an evening in the mountains. Yes, I hadn't showered and had to wear a mishmash of other people's clothes to dinner and the put my same Saturday outfit back on for Sunday, but no one cared. Yes, I had nothing with me but my phone and water bottle, but I didn't care. Even in the morning, when I hoped to get back home with plenty of time to go through my Sunday "routine," I said screw it and I stayed. I went on a walk, I had breakfast, I sat around and chatted, I went and rented bikes and rode through a gorgeous mountain pass. I had conversations. I met new people. I got to see the beautiful mountains. Most importantly, I felt welcomed, loved and appreciated. You've heard it before, but I'll say it again: life is best outside of your comfort zone. It's less scary stay at home and do the things you know you like to do. It's easy to read a book, watch a movie, go for a walk around your neighborhood, or even see the same person you see every week. But when I'm actually around other people, when I give up the plan and I do things that I don't normally do or can't control, that's when I feel the most fulfilled, the most alive, most in-the-moment, and the most like myself. Dear rental car companies, thank you for being rude yesterday. Love, Katie. I know, it's been a while, but things have been pretty crazy! While I have been busy, I've also been decompressing from a big weekend and dealing with dog-sitting. I'm with one dog this week, Monday through Friday, then on Friday, I switch to two dogs for SIXTEEN nights! You read that right! But let's move on because that's not what this post is about! 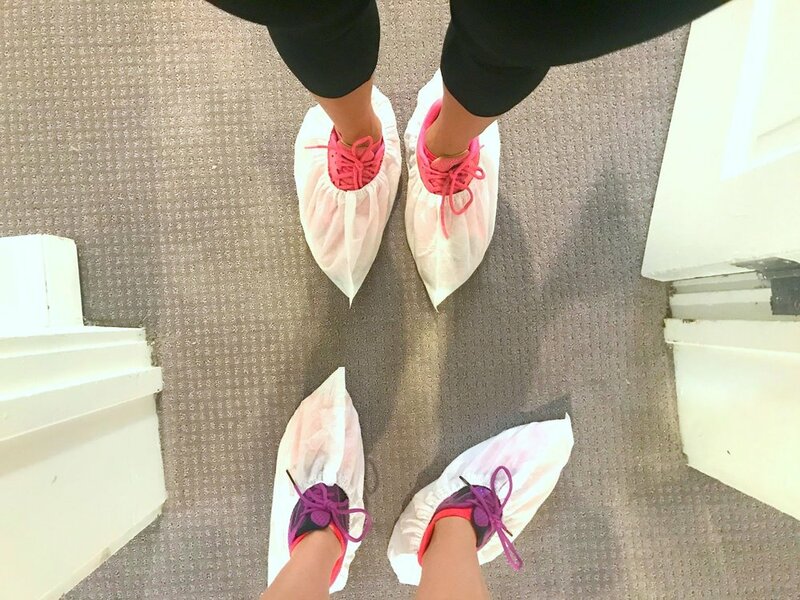 Today, I want to talk about my trip to New Orleans for the 2017 Beachbody Summit, which is essentially our big conference for Beachbody coaches. There were about 20,000 coaches there! This was the third year I've attended but the first time that I've been genuinely nervous. Why was I so nervous? Because this year I felt like an outsider. Do you ever feel that way? Like you're showing up for something and everyone else is on one page and you are totally somewhere else? Well, I was afraid that because I'm not really coaching right now that I'd either feel really separate from everyone else who is super fired up about coaching, or they'd all try to convince me to dive back in. To be honest, I almost didn't get on the plane. The whole morning that I was heading to the airport and getting ready to leave I had to keep fighting the urge to turn around and go back home. I was ready to leave my luggage and book it! Luckily, I have a few experiences and tools under my belt. I asked myself, what's the biggest reason you don't want to go? I realized that the ONLY reason I didn't want to go was that I was afraid. And you know what? I refuse to let fear drive my life. I know from many, many experiences that when I get out of my comfort zone and do something that I was nervous about doing, 99% of the time I am so glad that I pushed myself. I almost always end up thanking myself and God for that last push to get me to go because I always gain so much or at least have a fun time. And we sure had fun! Within a minute of seeing my teammates, I knew I'd made the right choice. It was so good to see them and hug them and they all told me they were so glad that I came. You know what? I'm so glad too. Yes, there were workshops around coaching and I zoned out more than I would have in previous years (although, to be honest, I'd heard of lot of it before!). But there were also some amazing speakers that I took pages of notes from, there were fun celebrations that I enjoyed watching with my teammates, but most of all, there were those moments when we were just hanging out together. 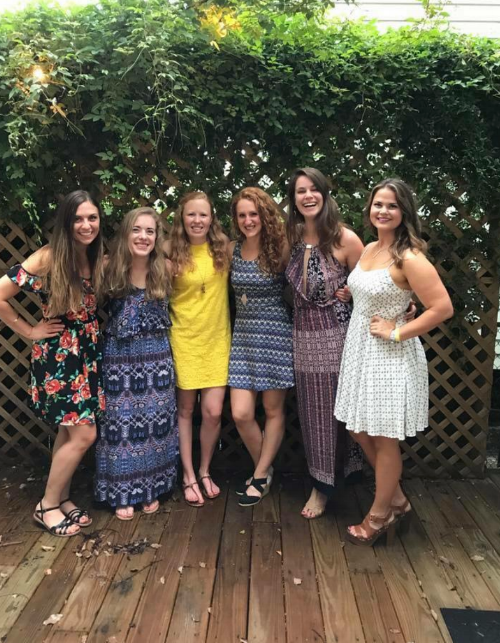 Whether it included adventures on Bourbon Street and Frenchman Street or sitting on the floor of a conference center, I loved every minute with these women. Some of them are friends I'd met at previous conferences and talked with over the year, others were women I knew of but I'd never really talked to or seen in person. 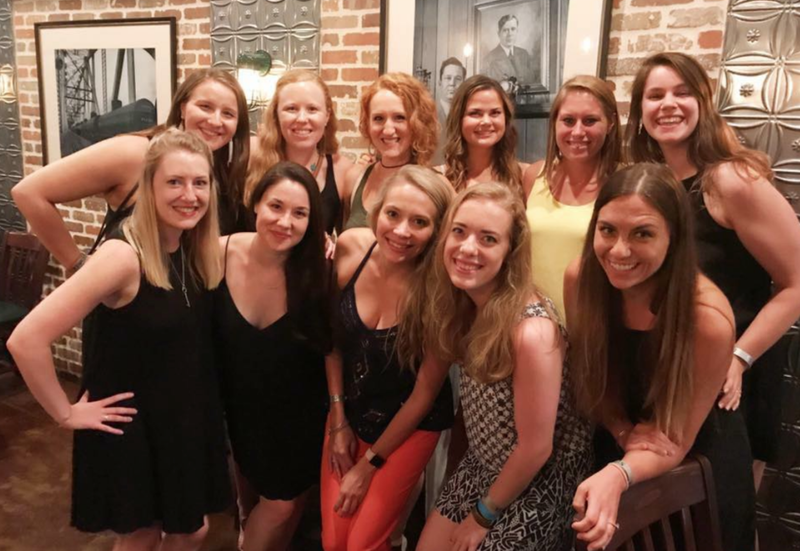 My coach, Anna, has done an amazing job of attracting a group of women who all seem to just "get" each other. Some of the girls I'd never spoken to and suddenly we're realizing just how similar we are and could have talked for hours. I wish we'd been able to, but the time just flew by! So, as I expected when I pushed myself onto that plane, I had a great trip. I made memories that will last me a lifetime, I made new friends, I reconnected with old ones, and I got to see New Orleans through a 29 year-old's eyes rather than a 20 year-old's. Next time you find yourself presented with an opportunity and it makes you freak out a bit with fear and anxiety, ask yourself: "Am I being led by fear or led by love?" Push yourself out of your comfort zone and you'll either be rewarded with a great experience or at least you'll learn something about yourself. Well, hey there! I know, I know, I start blogging again and then disappear for a week! To my defense, this has been quite a month! I've been busy every single weekend (when I do most of my writing) and out of town most of the last week! I'm hoping to get back into a better blogging schedule soon, so stay tuned! Today, I thought I'd catch you up on what's going on in my life by having a virtual coffee date. While I'd love to get coffee with each and every one of you, this will just have to do! ... that I got to go on an overnight field trip last week! The 7th-grade class went to Keystone Science School for three days last week and because they have so many girls in the grade they needed an extra female chaperone. I was asked if I could go and help out and, of course, I said yes! Although I was a little nervous, it turned out to be a LOT of fun. I loved getting to meet most of the kids and watch them interact (oh, Middle School...) as well as get to know the 7th-grade faculty. Spending three days in the mountains didn't hurt either! ... that when I got home from Keystone I took a shower, repacked my bag, and then headed out on my next adventure! 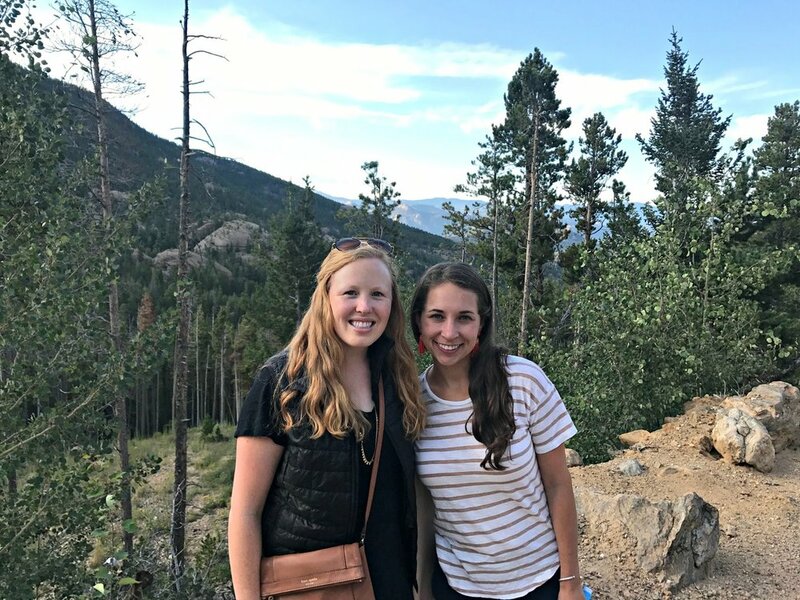 My friend, Maddie, and I got an Air BnB near Vallecito Lake, CO and made a road trip out of Memorial Day weekend. We drove to Colorado Springs on Friday night, then headed out early that morning. 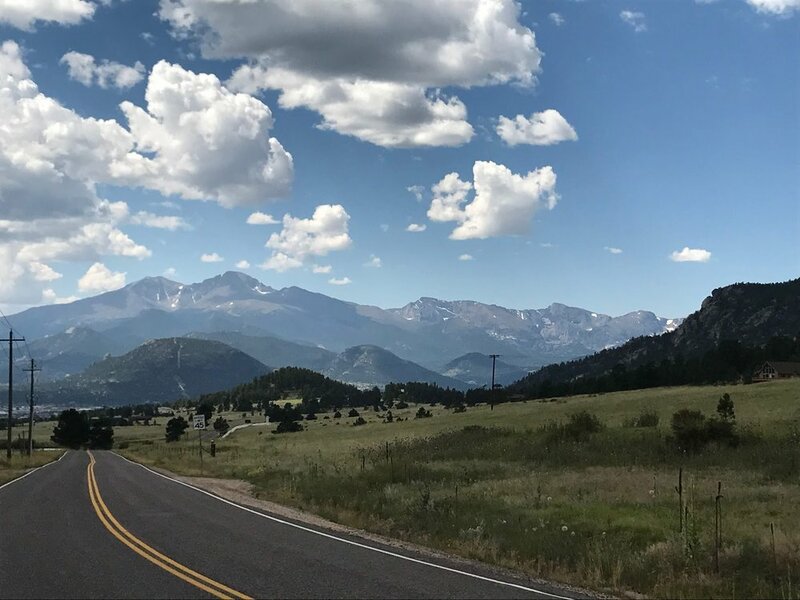 Over the weekend we saw some beautiful views driving across Colorado, went hiking, ate s'mores, relaxed at the yurt, went to an event at a local vineyard, and enjoyed lake life! ... that while I thought the yurt was cute and I loved being in the woods, I would not recommend the bathroom situation. It was basically a metal screen and a compost toilet... I survived for a couple days but it wasn't exactly my favorite part of the trip. But you have to try everything once, right?! ... that I realized during my two trips how many times I think to myself, "I wonder how/what/when...." and then never actually look up the answer. Don't you ever think of a question you have about something but then never look up the answer? While we were driving, I decided to start actually writing down some of these questions. Some are funnier than others... but at least now I have them written down so I can look them up! ... that I am SO EXCITED FOR SUMMER! This is the last week of school for the students and while I don't actually get summers off (we have a LOT to do during the summer!) we do get shortened hours and most of us use our vacation days during this time since things were too busy during the year to use them. I'm hoping to do more hiking, writing, meeting people, and maybe even a few fun things like going to the driving range, batting cages, or even sailing! ... that I'm not following a workout program! I know, so unlike me, right?! Right now I'm just going with the flow and doing what I feel like and I have to admit - six days off while traveling was kind of nice! Although I was not quite as excited about it during those driving days... However, I think after a few weeks of just going with the flow I'm ready to push myself again! I'm thinking of trying out a new program from Beachbody called Shift Shop when it comes out in July but I need something to do in June! ... that I've been horrible about going to church on Sundays. The last time I went was Easter, and it's not just because I've been busy! I really need to get back into the habit. I have to admit, it was much easier to go to church in Chicago because I knew I'd see my friends there and they were expecting me. I tried joining a small group but it was disorganized and kind of fell apart. I need to find something new!